Since this is a ticker collection application we want this to run every now and again. At first I thought about using excel to schedule itself, but too many things generally go wrong with that, and we want to make this completely unattended. Let's say every hour, 24 hours a day. 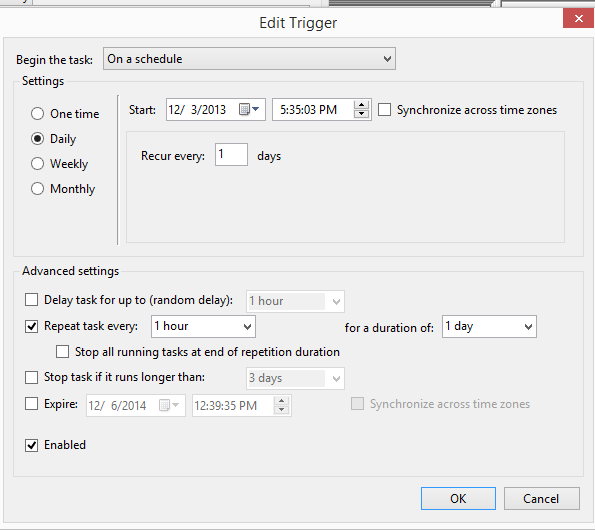 We'll use the windows task scheduler - and we'll also put the workbook on Google Drive. That way, some PC somewhere can take care of updating, and any other PC can access the latest version, courtesy of google drive. We can write a simple windows script to open a workbook, run something, and save the updated file. It looks like this , and will take the argument of the workbook name, and the function to run. Next we'll create a windows batch file, that calls it, with the appropriate arguments. cscript "C:\Users\Bruce\Google Drive\Under Development\ramblings\updateBitcoin.vbs" "C:\Users\Bruce\Google Drive\Under Development\ramblings\bitCoinAuto.xlsm" "doBTCUpdates"
with properties like this - running the .bat file we created. Without doing anything else, this will be synchronized to Google Drive. I've shared it out publicly, so you can access the latest update at the link below.